HDMI is implemented on just about every piece of sufficiently advanced consumer electronics. You can find it in low-end cellphones, and a single board Linux computer without HDMI is considered crippled. There’s some interesting stuff lurking around in the HDMI spec, and at DEF CON, [Joshua Smith] laid the Consumer Electronics Control (CEC) part of HDMI out on the line, and exposed a few vulnerabilities in this protocol that’s in everything with an HDMI port. CEC is designed to control multiple devices over an HDMI connection; it allows your TV to be controlled from your set top box, your DVD player from your TV, and passing text from one device to another for an On Screen Display. It’s a 1-wire bidirectional bus with 500bits/second of bandwidth. There are a few open source implementations like libCEC, Android HDMI-CEC, and even an Arduino implementation. The circuit to interface a microcontroller with the single CEC pin is very simple – just a handful of jellybean parts. [Joshua]’s work is based off a talk by [Andy Davis] from Blackhat 2012 (PDF), but greatly expands on this work. After looking at a ton of devices, [Joshua] was able to find some very cool vulnerabilities in a specific Panasonic TV and a Samsung Blu-ray player. A certain CEC command directed towards the Panasonic TV sent a command to upload new firmware from an SD card. This is somewhat odd, as you would think firmware would be automagically downloaded from an SD card, just like thousands of other consumer electronics devices. For the Samsung Blu-Ray player, a few memcpy() calls were found to be accessed by CEC commands, but they’re not easily exploitable yet. As far as vulnerabilities go, [Joshua] has a few ideas. Game consoles and BluRay players are ubiquitous, and the holy grail – setting up a network connection over HDMI Ethernet Channel (HEC) – are the keys to the castle in a device no one would ever think of taking a close look at. Future work includes a refactor of the current code, and digging into more devices. There are millions of CEC-capable devices out on the market right now, and the CEC commands themselves are not standardized. The only way for HDMI CEC to be a reliable tool is to figure out commands for these devices. It’s a lot of work, but makes for a great call to action to get more people investigating this very interesting and versatile protocol. Satellite television is prevalent in Europe and Northern Africa. This is delivered through a Set Top Box (STB) which uses a card reader to decode the scrambled satellite signals. You need to buy a card if you want to watch. But you know how people like to get something for nothing. This is being exploited by hackers and the result is millions of these Set Top Boxes just waiting to form into botnets. This was the topic of [Sofiane Talmat’s] talk at DEF CON 23. He also gave this talk earlier in the week at BlackHat and has published his slides (PDF). The Hardware in Satellite receivers is running Linux. They use a card reader to pull in a Code Word (CW) which decodes the signal coming in through the satellite radio. An entire black market has grown up around these Code Words. Instead of purchasing a valid card, people are installing plugins from the Internet which cause the system to phone into a server which will supply valid Code Words. This is known as “card sharing”. On the user side of things this just works; the user watches TV for free. It might cause more crashes than normal, but the stock software is buggy anyway so this isn’t a major regression. The problem is that now these people have exposed a network-connected Linux box to the Internet and installed non-verified code from unreputable sources to run on the thing. It is literally that easy. The toolchain to compile the STLinux binaries (gcc) is available in the Linux repos. The STB will look for a “bin” directory on a USB thumb drive at boot time, the binary in that folder will be automatically installed. Since the user is getting free TV they voluntarily install this malware. Click through for more on the STB Hacks. If you weren’t at [Cory Doctorow’s] DEF CON talk on Friday you missed out. Fighting Back in the War on General Purpose Computing was inspiring, informed, and incomparable. At the very lowest level his point was that it isn’t the devices gathering data about us that is the big problem, it’s the legislation that makes it illegal for us to make them secure. 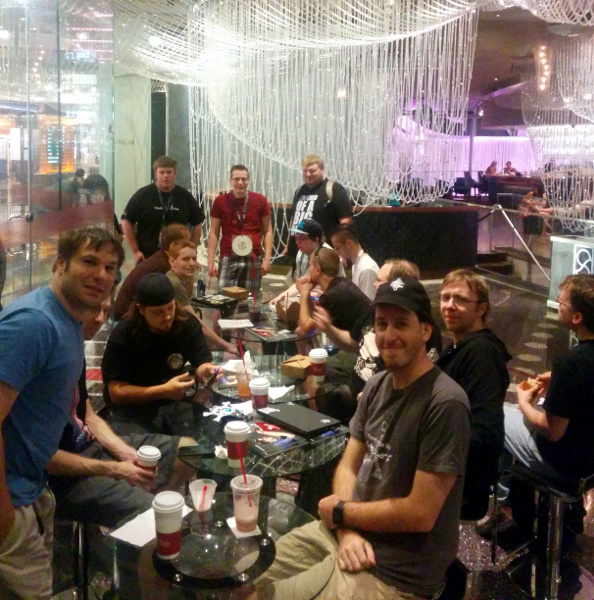 The good news is that all of the DEF CON talks are recorded and published freely. While you wait for that to happen, read on for a recap and to learn how you can help the EFF fix this mess.